Information prepared for the Sejm and the Senate on the participation of the Republic of Poland in the work of the European Union from July to December 2010 (during the Belgian Presidency). Information prepared for the Sejm and the Senate on the participation of the Republic of Poland in the work of the European Union from January to June 2010 (during the Spain Presidency). Opinion of the Polish Senate on the inconsistency with the subsidiarity principle of the proposal for a regulation of the European Parliament and the Council amending Council Regulation (EC) No 2007/2004 establishing a European Agency for the Management of Operational Cooperation at the External Borders of the Member States of the European Union (Frontex) COM (2010) 61. 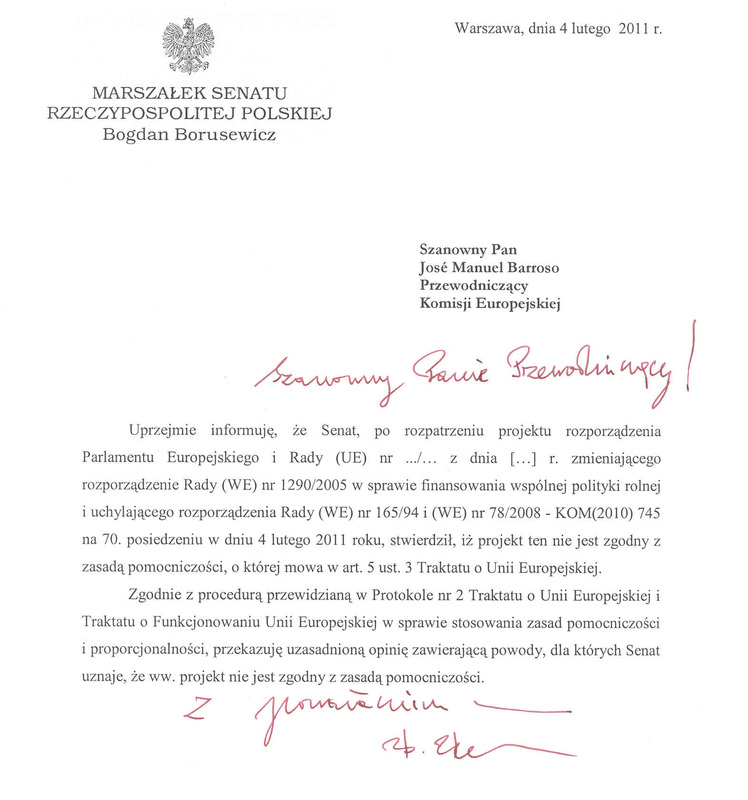 Information prepared for the Sejm and the Senate on the participation of the Republic of Poland in the work of the European Union from January to June 2009 (during the Czech Presidency). Information prepared for the Sejm and the Senate on the participation of the Republic of Poland in the work of the European Union from July to December 2008 ( during the French Presidency). Information of the Council of Ministers on participation of the Republic of Poland in the work of the European Union from January to June 2008 ( during the Slovenian Presidency). Debate on the Annual Policy Strategy of the European Commission for 2009. Law relating to the ratification of the Treaty of Lisbon amending the Treaty on European Union and the Treaty establishing the European Community, signed at Lisbon on 13th December 2007. Information of the Council of Minister on participation of the Republic of Poland in the work of the European Union from July to December 2008 ( during the Portuguese Presidency). Debate on the EU Commission Legislative and Work Programme 2008.